Feeling the wind on its wings for the last time, the space shuttle Endeavour, bolted to the back of a NASA jumbo jet, completed a three-day valedictory tour Friday, making low-altitude passes over San Francisco and the Golden Gate Bridge before thrilling crowds in Los Angeles as it passed over the Santa Monica Pier, the Hollywood sign, the Rose Bowl and other area landmarks. 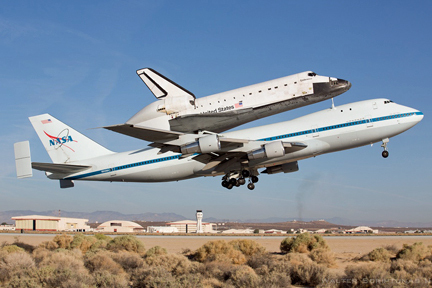 Escorted by two F-18 chase planes, the NASA 747 transport jet and its 78-ton cargo landed at Los Angeles International Airport at 3:52 p.m. EDT (GMT-4) to wrap up a three-day cross-country trip that began Wednesday with departure from the Kennedy Space Center. 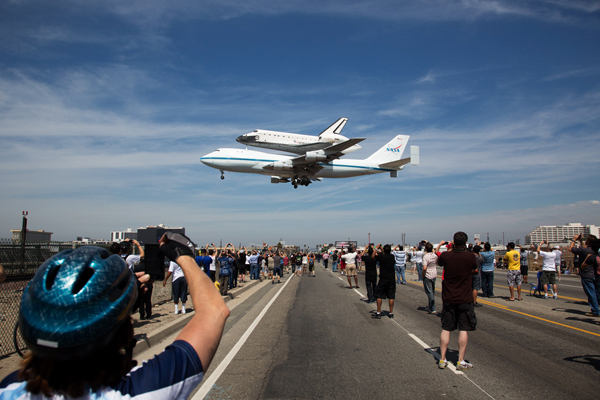 It was the final flight of a space shuttle and area residents turned out in droves to witness its passing, including more than 20,000 gathered on a runway at NASA's Ames Research Center just south of San Francisco. NASA managers, current and former astronauts and other dignitaries stood by at a United Airlines hangar at LAX where Endeavour will be stored temporarily before it is hauled to the California Science Center next month to go on public display. "I can't help but go off script and just begin by saying welcome home, Endeavour, welcome to California," said Jeffrey Rudolph, president of the California Science Center. "Twenty years ago, we had a bold dream and a vision to create a world class science center which included a space shuttle. It was a key part of our mission of stimulating curiosity and inspiring science learning in everyone. "It is so fitting that Endeavour's ultimate mission is to inspire millions of people, particularly young people, who will experience this national treasure for generations to come." The valedictory tour featured low-altitude passes over the Kennedy Space Center, NASA's Stennis Space Center near Bay St. Louis, Miss., and Lockheed Martin's Michoud Assembly Facility in New Orleans before an overnight stay in Houston near the Johnson Space Center. Early Thursday, the flight continued, with passes over Austin and El Paso, Texas, the White Sands Test Facility near Las Cruces, N.M., Tucson, Ariz., and Edwards Air Force Base in California's Mojave Desert, where the shuttle spent Thursday night. Early Friday, the 747 carrier aircraft took off again, flying Endeavour north to San Francisco, Sacramento and communities along the coast before passing over Vandenberg Air Force Base, Malibu, Santa Monica and then a series of Los Angeles landmarks, including Griffith Observatory, the iconic Hollywood sign, downtown Los Angeles and Disneyland. "Just flew over my head!!! Don't see this everyday," actor Tom Hanks tweeted. "Never will again. The Spaceman in me just went berserk." 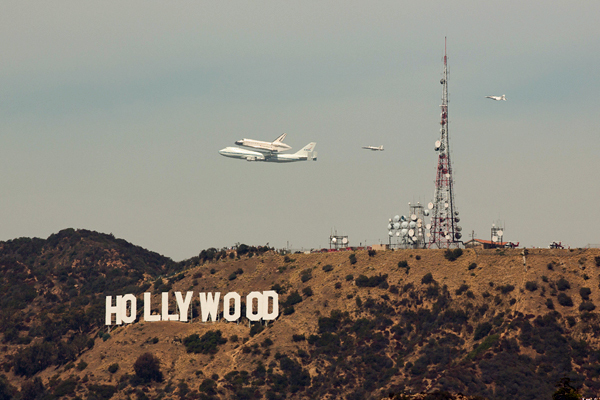 The air space over Los Angeles was restricted during the shuttle's fly over as the transport jet followed a winding low-altitude flight path repeatedly carrying it over one landmark after another, including an extremely low-altitude pass down the runway at LAX. Earlier this year, NASA delivered the shuttle Discovery to the Smithsonian Institution's Steven F. Udvar-Hazy Center at Dulles International Airport near Washington. The prototype shuttle Enterprise was flown to New York and then moved by barge to the Intrepid Sea, Air & Space Museum on the west side of Manhattan. NASA's lone remaining shuttle, the Atlantis, will remain at the Kennedy Space Center, moving to a new $100 million display facility at the privately run spaceport Visitor Complex on Nov. 2. Atlantis will go on public display next summer.